Is there a battle taking place in your church, leading to divisions and splits? Can you do anything to stop the infiltration of the enemy? Through prophetic insight and personal experience in many churches, the author will expose a hidden snare used by Satan to undermine God’s purposes in His Church. 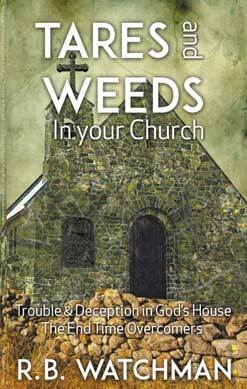 Tares and weeds are counterfeit Christians. They are often unknown pawns of the enemy, used to sabotage Kingdom work and all who are involved in it – to discourage, dishearten, depress or even destroy! They are planted to ultimately resist God’s will being fulfilled. R. B. Watchman was born shortly after the end of World War II and has had a rich and fruitful life in the Lord after a dramatic encounter with the Holy Spirit in the 1980s. He continues in active Christian service, often counselling and advising pastors and those in Christian ministry. He is the author of The Holy Spirit in a Man, one man’s compelling journey of faith and intercession. Appendix A – No Revival!